The SharePoint list no longer exists or you cannot connect to it. 2) Select File, and then click Account Settings. 3) Click Account Settings, and then click SharePoint Lists. 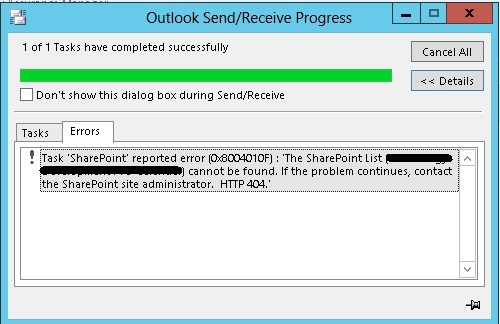 4) In the Account Settings dialog box, double-click the SharePoint list for which you received the error. 5) Clear the check on Display this list on other computers with the account: and then click OK.
Make sure that the SharePoint list for which you received the error is still selected, and then click Remove. 6) Close the Account Settings dialog box.